Set a private app name e.g. Kit Builder and an email if you wish. In the Kit Builder backend, copy the password into the 'Private App Authentication Password' field and save. 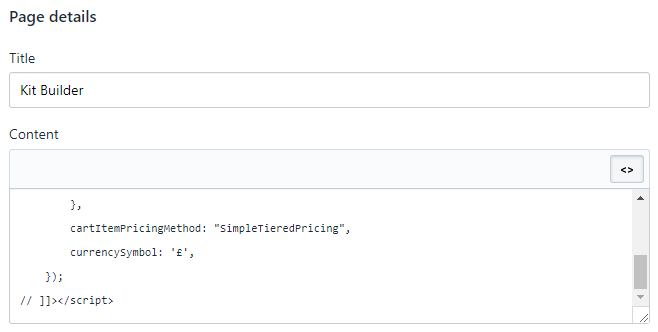 Use Shopify to add the HTML listed under the Shopify Authentication tab In the Kit Builder backend. Remember to modify the distributor ID. To add a page, in the Shopify admin, click Online Store, then Pages. To insert the code click on the <> button on the top-right of the Content field. If you have any issues when inserting the Kit Builder into your Shopify website please let us know click here. Remember to include as much detail as possible & a link to your website.